At the beginning of the game when you meet up with Mayor Theodore, he asks you which location you would like to set up your farm at. Each of the locations have different advantages and disadvantages. Village Center: This spot is just a hop from the town plaza, the clinic, and the tool shop. Since it's so close to the town there isn't much land to plant crops or build barns on. It's also close to the Moonlight Mine and the ocean dock. Ocean Side: The farm build here is in the far southwest corner of the world, with plenty of open space around it. It's far from the town but near the workplaces of Nina, Kurt, and Joe. The soil isn't very good though, and you'll have to plant in other locations or use a lot of fertilizer. River Side: A mix between the two other spots, which some good patches of soil for crops, but limited spaces for livestock barns. Since it is right next to the river it's a good spot if you really like to fish! This spot is just west of Blue Sky Ranch where Ellen, Bob, and Blue work. Once you select your spot you can't change it, so choose which you feel will work best for you. Remember that other people may set up their shops and live close to you, which may or may not be to your advantage. Theodore reminds you that pressing the Z button allows you to see the ownership of the surrounding lands. This is very important to know! Blue Land: Belongs to you, and you can do what ever you want on it. You can only build barns on your own land. Yellow Land: These areas belong to someone else in the village. You can't build on them or plant crops. Be respectful of your neighbors! Green Land: Up for grabs! You can plant crops on green land but not any animal barns. Just because it's green now doesn't mean it will stay that way! Even if you have your eye set on an area of land, it might already be reserved for a person who might move in later. If you plant crops on a green-colored land there's always the potential that someone will move their house on top of your plants the next day. It's best to plant crops on blue land you own. Red Land: This only belongs to your rival farmer. Jamie won't purchase any other land in the village so there's no rush for you to aquire more land. 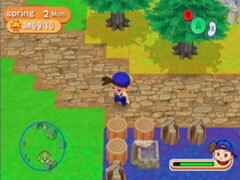 You can see the names of the land plots by going into your menu screen (press the Y button) and viewing the World Map. To be able to purchase more land you will need to befriend Mayor Theodore. As he increases the number of hearts he has, the more land plots will become available to buy at Woody's carpenter shop. You can check how many hearts Theodore has by going into your Villager summary menu.